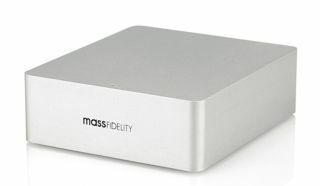 Mass Fidelity launches Relay Bluetooth DAC | What Hi-Fi? The Mass Fidelity Relay Bluetooth DAC allows users to stream music over Bluetooth to their existing hi-fi in the "highest possible quality". The Relay Bluetooth DAC doesn't need to be set up on a home wi-fi network, nor is it controlled via an accompanying app - users are required to just plug-and-play, and any music player app can be used, as audio is transmitted via Bluetooth. The Relay DAC features a Burr-Brown DAC, usually found in more expensive audio equipment. This, coupled with a Cirrus microprocessor to decode lossless aptX Bluetooth, is claimed to retain "all of the musical detail". The Relay can be used within a system that already contains an outboard DAC thanks to a Uni-fi output stage. Users have to press the power button for five seconds, after which the two RCA jacks output 24-bit S/PDIF digital, meaning audio can be streamed to two outboard DACs at the same time. The Mass Fidelity Relay DAC is available now for £199 from Anthem AVS.